The heart should work in a regular, steady pattern. Arrhythmias are breaks in the pattern. It may happen in a short burst or last over long periods of time. Most will not affect overall health. Some arrhythmias can slow the flow of blood to the body or increase the risk of other health problems such as stroke. Not all arrhythmias will cause symptoms. Some arrhythmias may be felt as a fluttering in the chest, skipped heartbeat, or fast heartbeat. The doctor will ask about your symptoms, medical history, and family history. A physical exam will be done including listening to your heart, taking your pulse, and looking for any signs of heart problems. ECG —Records the heart's activity for a period of time. Holter monitor —An ECG that records heart activity over 24-48 hours. It can help find arrhythmias that do not occur in a regular pattern. Exercise stress test —An ECG that is taken while you do a physical activity. It can help find arrhythmias that only appear with physical stress. Electrophysiological study —Wires are passed through blood vessels to the heart. 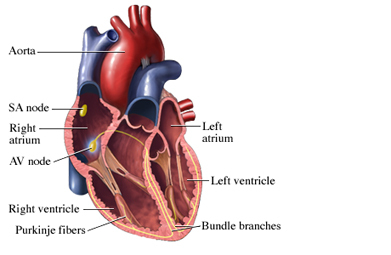 The wire sends electrical signals to the heart to try to start an arrhythmia. This will help to find where the arrhythmias is starting in the heart. Medications—Can be used to slow down or speed up your heart rate. May also fix imbalances in the body that are causing the arrhythmia. Cardioversion—Paddles send an electrical signal to reset the pattern of the heart. Implantable cardioverter defibrillator (ICD)—The device will shock the heart when a dangerous arrhythmia happens. Artificial pacemaker —Provides regular electrical signals to keep the heart in a steady rhythm. Ablation —An area of the heart that starts a bad electrical signal is removed or scarred. Maze procedure and mini-maze procedure —A pattern of scar tissue is made in the upper chambers of the heart. It makes a special path for the electrical signal to pass. Carefully manage other heart or medical conditions that increase the risk of arrhythmias. Avoid substances that trigger arrhythmia or make it worse. This includes caffeine, alcohol, or tobacco. Talk to your doctor about a safe exercise program . Do not smoke. If you smoke, find out ways you can quit . Eat a healthful diet that is low in saturated fat and rich in whole grains, fruits, and vegetables. Arrhythmias. American Heart Association website. Available at: http://www.heart.org/HEARTORG/Conditions/Arrhythmia/Arrhythmia%5FUCM%5F002013%5FSubHomePage.jsp. Accessed November 28, 2017. Arrhythmia. Texas Heart Institute website. Available at: http://www.texasheart.org/HIC/Topics/Cond/Arrhythmia.cfm. Updated August 2016. Accessed November 28, 2017. Atrial fibrillation. EBSCO DynaMed Plus website. Available at: http://www.dynamed.com/topics/dmp~AN~T115288/Atrial-fibrillation . Updated July 31, 2017. Accessed November 28, 2017. Explore arrhythmia. National Heart, Lung, and Blood website. Available at: https://www.nhlbi.nih.gov/health/health-topics/topics/arr. Updated July 1, 2011. Accessed November 28, 2017. Sick sinus syndrome. EBSCO DynaMed Plus website. Available at: http://www.dynamed.com/topics/dmp~AN~T113692/Sick-sinus-syndrome . Updated December 8, 2015. Accessed November 28, 2017. Ventricular arrhythmias. EBSCO DynaMed Plus website. Available at: http://www.dynamed.com/topics/dmp~AN~T909129/Ventricular-arrhythmias . Updated March 31, 2017. Accessed November 28, 2017.